Today at CTIA Kingston announced an even more potent version of their Wi-Drive portable wireless storage device: a 64GB version. For those not in the know, Kingston's Wi-Drive is a portable, wireless storage device that is compatible with pretty much any wireless-capable device you may own, from iPhones and iPads, to Android devices and even Windows Phones. Simply put, the Wi-Drive lets you store any content that you may be interested in accessing remotely from any wi-fi enabled device. In our demo, a representative from Kingston uploaded everything from music, pictures, documents and even movies, and with what apppeared to us to be little if any lag, was able was able to stream this content to an iPad as well as an iPhone simlutaneously. 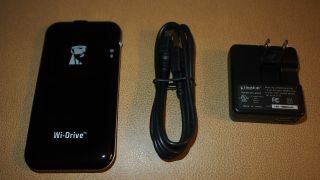 While Kingston states that you can use Wi-Drive with up to three devices simultaneously, that limitation isn't hard-wired. Simply put, you can access the Wi-Drive from any number of devices simultaneously. The thing is, the more devices accessing the device, and depending on the type of content being accessed, things could bog down. The device charges via USB and lasts up to eight hours on one charge. The new Wi-Drive that was announced today at CTIA boasts a whopping 64GB of storage and while the MSRP for the 64GB has yet to be announced, the 32GB version is currenty available for $89.95. Users can easily access the data on their Wi-Drive via a web browser or with the free to download Wi-Drive app for various mobile devices.